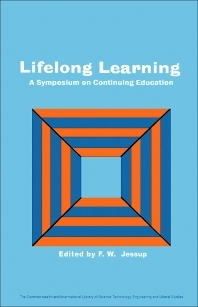 Lifelong Learning: A Symposium on Continuing Education is a selection of papers presented at the December 1965 meeting of the UNESCO International Committee for the Advancement of Adult Education. Contributors focus on the importance of lifelong learning and its practical implications, offering views on a wide range of topics such as continued professional education, industrial education, the media of mass communication, and the role of schools, colleges, and universities in promoting adult education. This book is comprised of nine chapters and opens with a discussion on the idea of lifelong learning and its implications for formal educational institutions. The following chapters deal with professional education; industrial education; the media of mass communication; and whether voluntary associations, whose ends are not primarily educational, should think of themselves as having some responsibility for helping their members to achieve lifelong learning. The responsibility of libraries and museums as well as public authorities in promoting adult education is also examined. The final chapter evaluates lifelong learning in relation to social and economic policy. This monograph will be of interest to educators and policymakers.